Born in Huntsville, Ontario, Murray Favro moved to London in his teens and, in his 20s, became a key figure in the burgeoning London arts scene. Befriending Greg Curnoe, Jack Chambers, and Bernice Vincent (among many others), Favro helped establish London as a centre for Regionalist art. In 1965, he was also a founding member of the Nihilism Spasm Band, a collective that, even today, eschews musical structures and traditional instruments and blithely rejects conventional hierarchies between instruments: a homemade kazoo and 3½ string electric bass hold court with drums and vocals to produce spontaneous explosions of sound. Favro’s guitars have provided a recurring motif in his oeuvre, one that he returns to and refines as he makes ever more daring forays into the realms of technology and installation art. 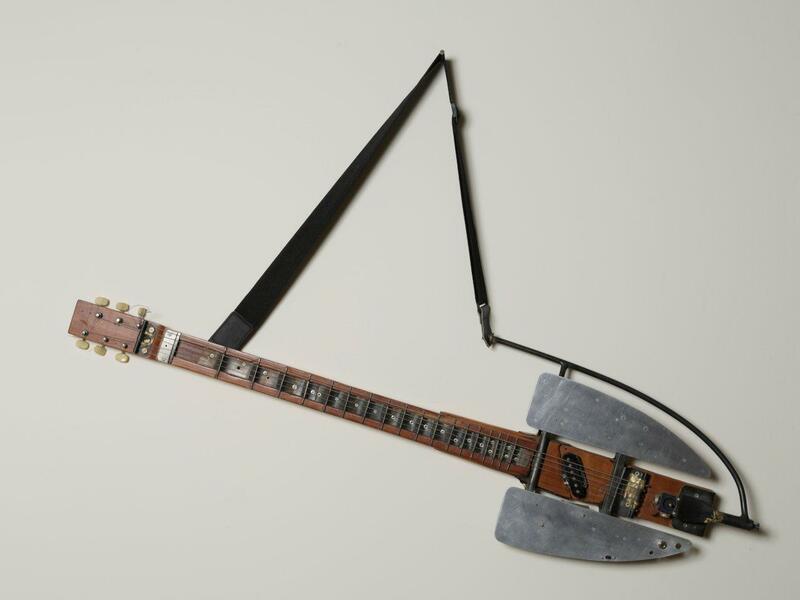 In the nearly 20 years separating his first guitar from this work in the Museum London collection, Favro has proven his mettle as an ingenious inventor, exploring the powerful effects of combining 3D objects and projections, and meticulously reconstructing such feats of engineering as a Sabre Jet. 1. Murray Favro, quoted in “Band Members: Murray Favro,” Nihilism Spasm Band website, http://www3.sympatico.ca/pratten/NSB/. Favro is still a member of the NSB.